With a wide variety of options, yogurt lovers can get their fill even if they are dairy-free. One of the hottest dairy-free alternatives is of the coconut variety. In fact, since the FDA defines yogurt as a product strictly derived from dairy, the technical term for a "yogurt" made from coconut products should be deemed a “yogurt alternative.” Learn more about the creamy options and healthy attributes below. Coconut yogurt may contain anywhere from 10 to 25 grams of carbohydrate. Part of the variation occurs because of the flavoring that may or may not be added to the product. Unsweetened coconut yogurt (shown on label) is likely to be the lowest carb product, providing just ten grams per one-cup serving. While you are scanning labels to check nutrition facts, keep reading down towards the sugar totals. Most yogurts contain some added sugars, but some are more highly sweetened than others. Natural sugars from fruit don’t wreak the same havoc on blood sugar as more highly processed sugars do, so pick a brand with that in mind. A standard 5.3 ounce container of flavored coconut milk yogurt alternative contains 110 to 140 calories and 4 to 7 grams of total fat. Most of the fat in coconut yogurt is usually saturated fat. The saturated fats found in coconut milk may be of concern for some. Excessive amounts of saturated fat aka the “unhealthy” type of fat is connected to elevated LDL cholesterol levels and an increased risk of heart disease. While the amount of saturated fat found in a coconut yogurt is not excessive, those with high cholesterol or suffering from heart disease should monitor and moderate their intake of these types of fats. Unlike traditional yogurt made from cow's milk, coconut yogurt is not a high protein food. An unsweetened cup of coconut yogurt provides less than a gram of protein. The same 5.3 ounce portion of traditional yogurt contains 5 to 6 grams of protein, while Greek yogurt is even higher with an average of 12 grams per serving, far surpassing the coconut milk type. As you find with most brands of traditional yogurts, there is likely calcium added to the mix of your favorite coconut yogurt. Check the labels on specific brands to determine how much (if any) has been added. But you are likely to get a healthy dose from most brands. You are also likely to get a healthy dose of vitamin D and vitamin B12 in many brands of coconut yogurt. If fresh fruit is added, you may benefit from other vitamins as well. 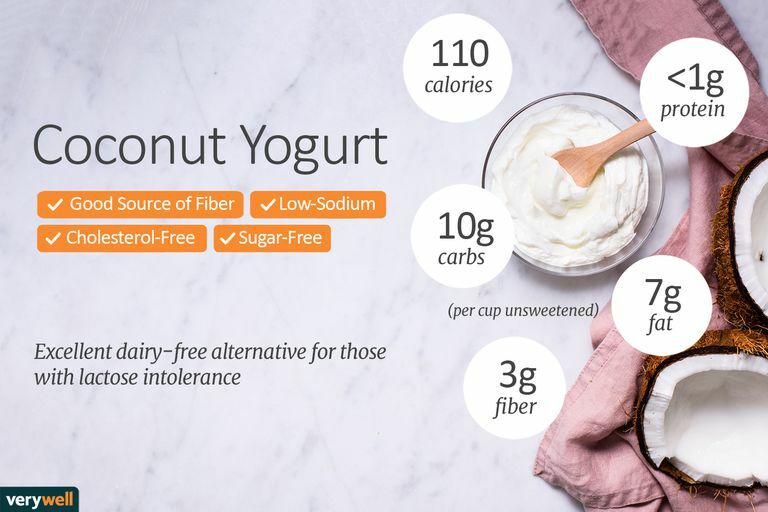 Coconut yogurt alternatives can be a healthy dairy-free yogurt option for those who need or choose to avoid dairy products. While Greek yogurt contains less lactose than traditional cow's milk yogurt, many people with lactose intolerance may be more comfortable avoiding it entirely. A coconut-based vegan style yogurt can also provide other nutritional benefits. The fermented sugars and tummy-pleasing probiotics can help regulate digestive health by providing an ample dose of healthy bacteria to the gut. Properly balanced gut bacteria is also correlated with improved immune function. Bones will also benefit from the added calcium and vitamin D, two nutrients that most folks need to get more of. What is coconut yogurt made from? The star ingredient in coconut yogurt alternative is, of course, coconut milk. The thick and creamy combo of blended coconut flesh and coconut water (referred to as coconut "milk") is often combined with fruit, flavorings, sweeteners and active cultures to create the vegan yogurt alternative. Most brands also contain some form of thickener such as rice starch, pectin or guar gum to add body and prevent separating. Why is coconut yogurt (often) more expensive than dairy yogurt? You can find an impressive amount of variations from brand to brand of coconut yogurt, so spend a few minutes reading labels before deciding which you want to buy. Since dairy-free yogurts are a smaller market, the price point is higher. Some brands of coconut yogurt will exceed $0.40 per ounce compared to $0.15 to $0.26 for brands of cow’s milk yogurts. Does coconut yogurt contain lactose? Coconut milk doesn’t contain the same kinds of natural sugars found in cow’s milk (also known as “lactose”), therefore coconut and some other dairy-free versions won't have the same ability to react with healthy bacteria, ferment, and develop that signature tangy yogurt flavor. To allow this reaction, a form of sugar is introduced. This may come in the form of an added sweetener or from a natural source like fruit juice or coconut water—the clear liquid found within a fresh coconut. It is possible to make your own coconut milk yogurt using a combination of canned coconut milk and powdered probiotics. Some recipes require stove top cooking or pressure cooking while others do not. Most recipes call for an activation period where yogurt and bacteria are left out at room temperature (usually about 24 to 48 hours) to allow for fermentation. Preparing yogurt in this fashion requires properly sterilized equipment to prevent the growth of yeast and unwanted bacteria, so proceed with caution. Smoothies and parfaits: The creamy texture and subtle coconut essence makes coconut yogurt an ideal pick for smoothies and parfaits. Blend with frozen fruit and a splash of water (or coconut water) or layer with fresh berries and granola. Baked goods: From muffins to quick breads to pancakes, yogurt helps keep all kinds of baked goods moist with less fat and calories. You can substitute equal parts cow's milk yogurt for coconut milk but it is worth nothing that making this swap will jack up the saturated fat content. Frozen treats: The higher fat content of coconut makes it an ideal choice for frozen treats. Pour coconut yogurt and fresh fruit into ice pop molds or whirl in an ice cream machine for a batch of fro yo. For a frozen finger food, use toothpicks or skewers to dip grapes or banana slices into yogurt. Transfer coated fruit to a parchment lined cookie sheet and sprinkle with chopped nuts before placing in the freezer to harden. Enjoy right from the freezer! Savory dollops: Plain coconut yogurt has a subtle sweetness and coconut flavor that is an amazing dairy-free alternative to cream in curry, soups and stews. Plain coconut yogurt can also be whisked with citrus juice or vinegar and spices to make creamy vegan dips, sandwich spreads and dressings. Overnight oats: Have a light morning meal or snack waiting for you when the alarm goes off! In a glass jar, combine rolled oats with yogurt, flax or chia seeds and a drizzle of honey or maple syrup; stir well. Cover and refrigerate overnight, serve topped with fresh fruit. According to the American Academy of Asthma, Allergy & Immunology, coconut allergies are very rare. But it is possible for a person with another nut allergy to also be allergic to coconut. Coconut allergy symptoms may be mild, such as hives, rash or eczema or more severe including anaphylaxis. Contact dermatitis is most likely. See an allergy specialist if you suspect a coconut allergy. And as always, get medical help immediately if symptoms are severe. Is There Anything Healthy About Butter? What Is Kombucha​​ and Why Should I Drink It? Are Avocados a Good Choice for a Healthy Diet?